Although over a thousand House Martins are ringed in Britain each year, their wintering grounds remain a complete mystery. This is partly because the species is rarely seen in the non-breeding season, with relatively few observed in Africa compared to the millions that winter in the continent. This has led to speculation that they might spend long periods of time feeding at high altitude, perhaps above the rainforest, where they can go unnoticed. Although there have been some recoveries of British-ringed House Martins in Europe and Africa, their migration strategies and routes are poorly understood. The development of tiny tracking devices, known as geolocators, has revolutionised our understanding of how small birds migrate. 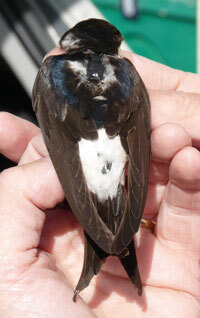 We had hoped to fit tracking devices to House Martins in 2013 to begin to unravel the mystery of their migration. However, with cutting-edge technology like this, our plans must be informed by our growing experiences with other species and used alongside the latest information gathered from international colleagues. Reports from House Martin tracking projects in Belgium and Sweden, and more recently from Hungary, with similar (though not identical) devices, show low return rates of tagged birds and, while this could be the result of a number of factors, our scientists decided that we should not deploy the tags. Tags smaller than the ones we planned to deploy are already available, but these don’t have a battery life expectancy long enough for us to track House Martins throughout their annual migrations. In the future, further developments mean they should be able to do so. Once the technology is available we can examine carefully whether the time is right to proceed.